Odd couple “road trip” films are as old as the hills or at least as old as the Bing Crosby-Bob Hope comedy classics. 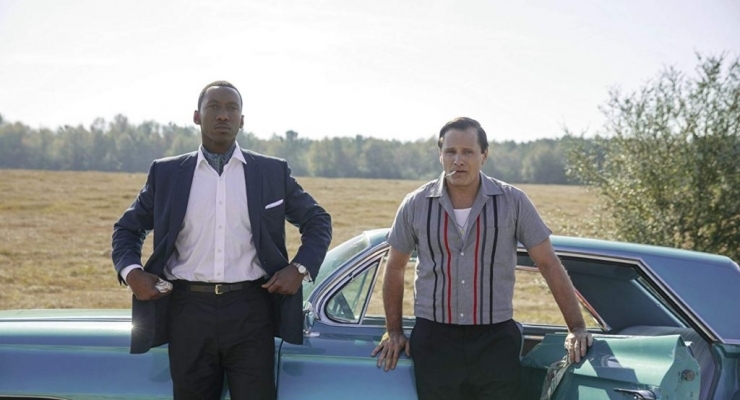 Green Book clearly belongs to this cinematic genre as Jamaican-American pianist Don Shirley (Mahershala Ali) hires Italian-American tough guy Tony “Tony Lip” Vallelonga (Viggo Mortensen) to drive him on a concert tour that includes a number of gigs in the segregated South during 1962. This film’s title refers to Victor Hugo Green’s guidebook to lodgings and restaurants that were willing to serve a black clientele prior to the passage of the Civil Rights Act. When Tony temporarily loses his bouncer job at the Copacabana nightclub, he must quickly find gainful employment to support his wife Dolores (Linda Cardellini) and their sons Nick (Hudson Galloway) and Frankie (Gavin Foley). Tony rejects the pianist’s initial job offer as it means two months away from his family but Dolores accepts it on his behalf after taking a phone call from Shirley himself. The two men are diametric opposites: Tony is a bigot, a messy eater, and spews expletive-laden language; “Doc” Shirley has refined tastes, is impeccably dressed, and speaks eight languages. Shirley is a lonely man whose heavy drinking often triggers bouts of erratic behavior that result in his life being threatened in a redneck bar or getting arrested after a late night tryst with a white man in a YMCA swimming pool. On each occasion Tony Lip intervenes and keeps the tour going so that his paycheck will continue. Don plays first-class shows, accompanied by bassist George (Mike Hatton) and cellist Oleg (Dimeter Marinov), to sold-out venues but often receives second-class treatment by his Southern hosts. In between concerts, Don mentors Tony on the art of romantic letter writing to Dolores and works on his driver’s social skills, as the bond between this odd couple begins to form. Green Book represents a major genre change from the wacky comedies like Something About Mary and Dumb and Dumber that writer/director Peter Farrelly had previously created with his younger brother Bobby. As a biopic that Farrelly coauthored with Nick Vallelonga, Tony’s son, and Brian Hayes Currie, this film presents a brief slice of the very successful life enjoyed by an artist whose wide-ranging repertoire included popular, jazz, and classical music. Mahershala Ali and Viggo Mortensen are consummate performers who get completely into their respective roles: Ali’s flying fingers on the keyboards will fool viewers into believing that he is actually making the music (spoiler alert: it is really the fingers of Kris Bowers who wrote the film score) while Mortensen put on forty-five pounds to better resemble his character. Together, this duo successfully makes the audience buy into the unlikely friendship that is gradually forged between these two very different men and one that, in real life, lasted for half a century. One of the film’s most telling scenes takes place in the 1962 teal Caddy sedan when Mortensen introduces Ali to the “art” of eating southern-fried chicken with, gasp (! ), his delicate ivory-tickling fingers. This just might be the best film that I have seen so far this year and one that poignantly recalls the personal quandary of being a black man who identified more closely with a white world that would not readily accept him offstage because of his race. 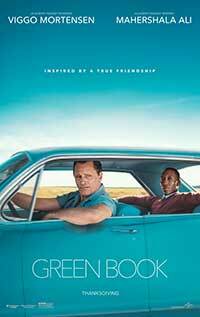 Telling a true story does not always produce watch-worthy results but all of the respective stars have aligned in Green Book, and we are rewarded with a truly heart-warming motion picture. Going out on a fairly sturdy limb, I can see Oscar nominations waiting in the wings for both of the leads. Highly recommended. This biopic tells the true story of the working class Italian-American Tony Lip who becomes the driver and eventual good friend to Black classical pianist Dr. Don Shirley during the era of segregation in the United States. An odd couple road trip film that unites a gifted pair of actors who bring their respective characters to life in this heart-warming true story.